The Cookery grounds now expand over 12,000 sq. 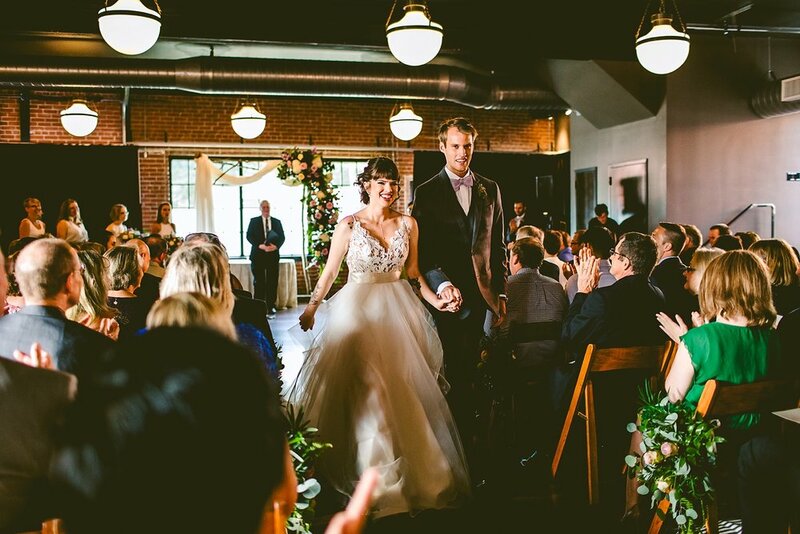 ft., and can accommodate seated dinners and wedding ceremonies for up to 330 guests*. 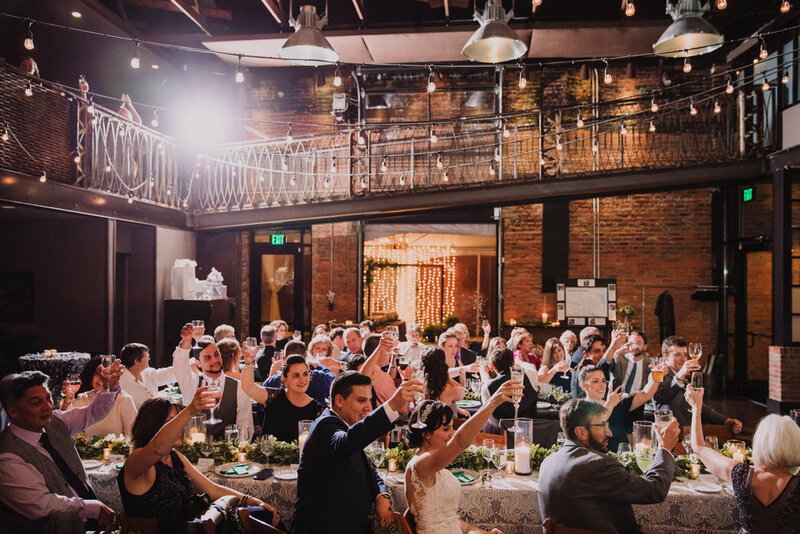 *For cocktail style events that do not include a wedding ceremony, we can accommodate 500 guests. Our Front Room boasts 20 foot high ceilings, a beautiful bar and mezzanine. Perfect for gathering guests for cocktails before your meal in the ballroom, and for continuing the celebration on the dance floor after you dine. This 2,500 sq. ft. space is also ideal for smaller, more intimate events. The ballroom is the ideal dining space for 256 guests. This 5,000 sq. 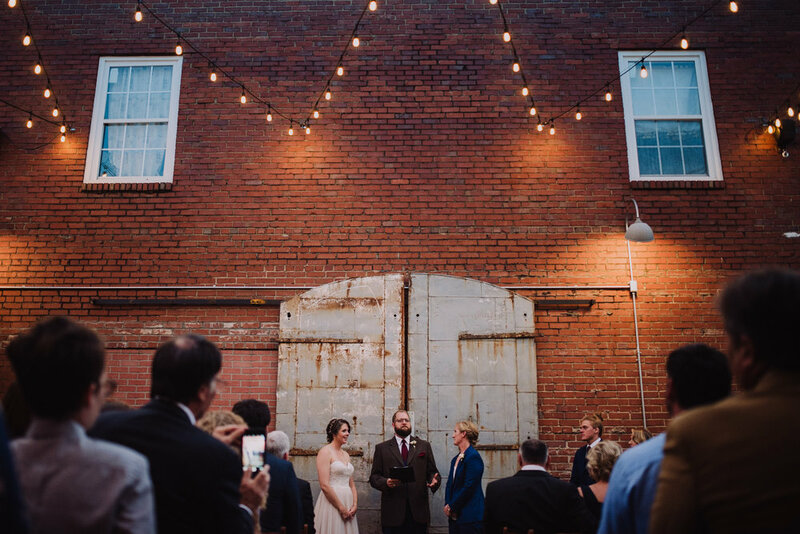 ft. space features original brick walls, vintage lighting, and large entrances to both the courtyard and our private garden. 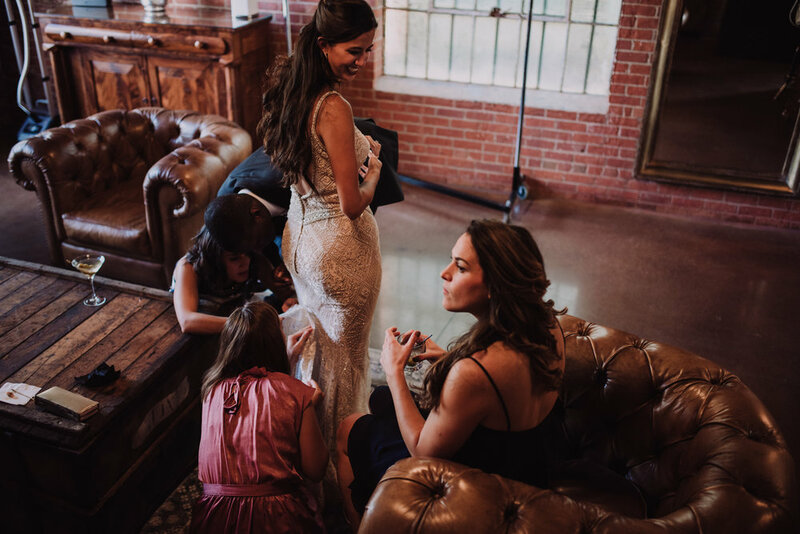 A private dressing suite connects to the ballroom, allowing the wedding party to have easy access to all of the festivities. Tucked away behind The Cookery is a lush cobblestoned garden. 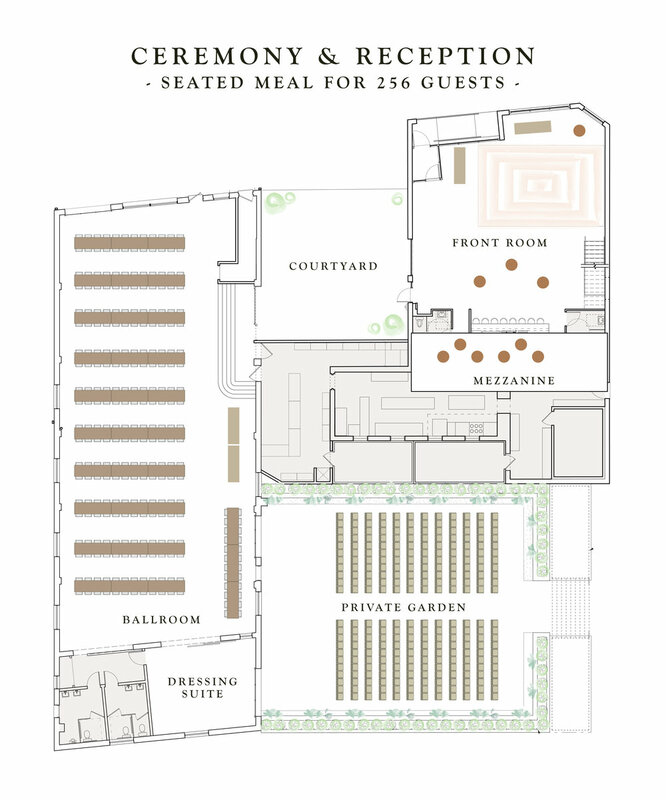 Space is available to seat up to 330 guests, or provide extra dining area. The garden can be tented. Market lights twinkle above your guests as they gaze up at the stars. Both the Front Room and the ballroom open up to the courtyard. We are located less than 5 minutes from Duke Chapel, Duke Gardens, and downtown Durham, with easy access to Highway 147. A full bar is available, featuring local NC beers on tap, hand crafted cocktails and professional bartenders. The Front Room's mezzanine allows guests and photographers to enjoy a bird’s eye view of the room. 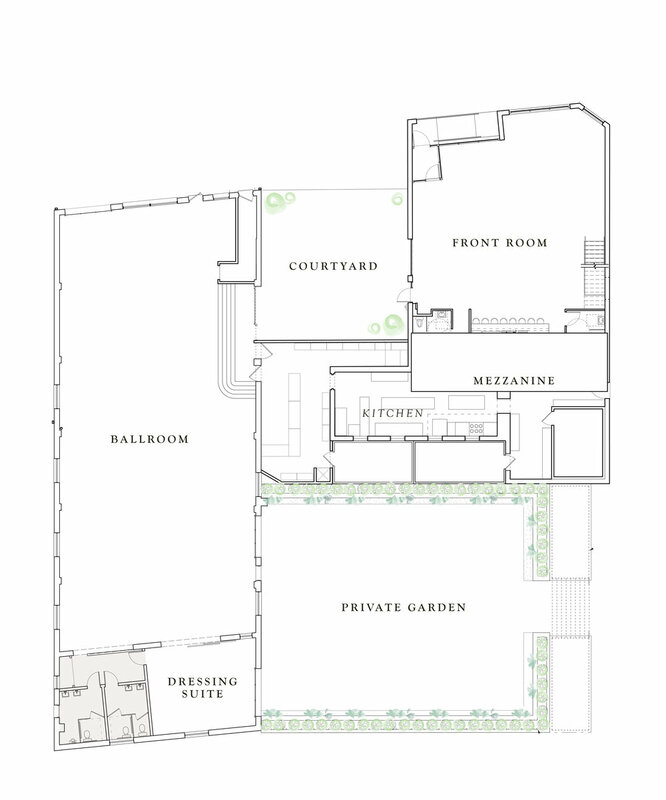 Outdoor grounds include two private spaces: our courtyard and the garden. Valet parking is included in our Full Grounds weekend pricing as a courtesy to your guests (~$500 value!). Dining tables, cocktail tables, chairs and glassware are included in the price of renting The Cookery. Our rental package includes much more than a beautiful space! When you rent The Cookery, you gain access to over $3,000 worth of rentals and services for free! 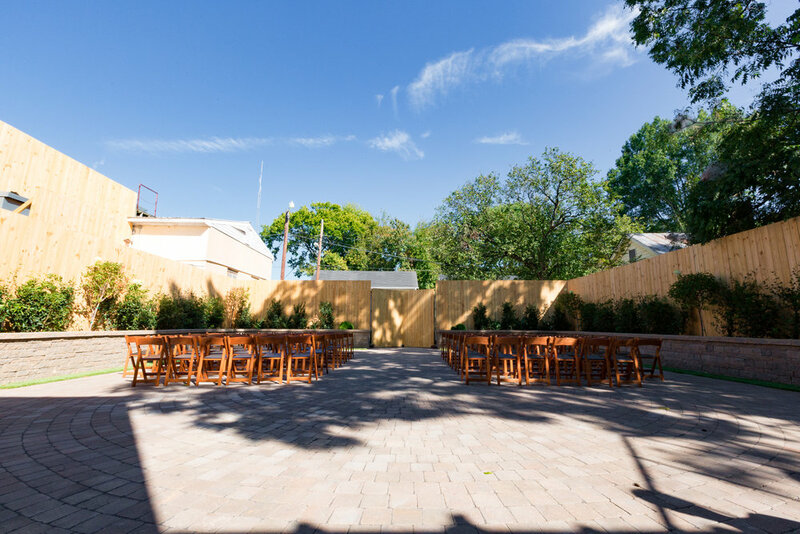 The Cookery grounds can accommodate a variety of layouts and party styles. Feel free to discuss these options during your tour!